I learned to crochet when I was in the third grade, but until recently, I had never tried to learn to knit, though I always planned to someday. 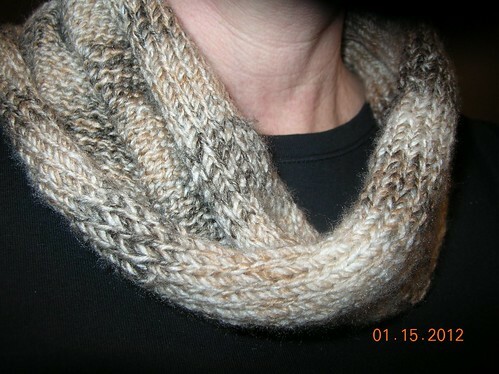 Well, I finally made someday happen, and decided to knit my mom a cowl for Christmas. 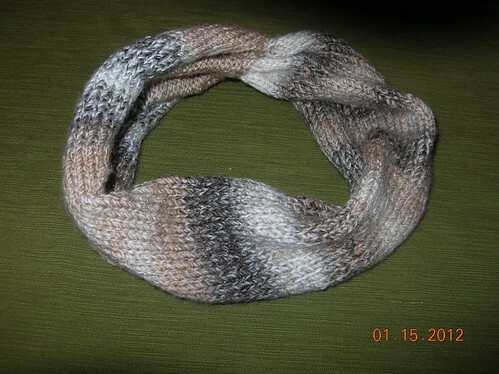 I did a simple stockinette stitch using a yarn I got from Joann's that was in a colorway I thought my mom would like. Stockinette stitch will curl in on itself. If you don't want this to happen, you should border your work with another stitch, like garter stitch. Always plan out how much yarn you need and what length you want it to end up. If you just say "I'll just go until I run out of yarn. ", you'll likely end up at an odd length where you wish it was either shorter or longer. You can make a pretty gather to hide the seam on the back (if you aren't knitting in the round) using the tails you're weaving in. You know me well! Love the colors and really like how it curls around the edges--gives it depth. Will definitely keep me warm whenever Winter decides to return to Colorado.